RSVP at http://bit.ly/GilbertTalk2018. Light refreshments will be provided. Dr. Tria Blu Wakpa is an Assistant Professor of Dance Studies in the World Arts and Cultures/Dance Department at UC Los Angeles. She received her Ph.D. and M.A. in Ethnic Studies from UC Berkeley and an M.F.A. in Creative Writing from San Diego State University. Tria is a scholar and practitioner of Indigenous contemporary dance, North American Hand Talk (Indigenous sign language), martial arts, and yoga. Her book project Native American Embodiment in Educational and Carceral Contexts: Fixing, Eclipsing, and Liberating politically and historically contextualizes dance, theatrical productions, basketball, gardening, martial arts, and yoga at four total institutions, located on Lakota lands in what is currently known as South Dakota. At UCLA, Tria is affiliated with the American Indian Studies Center. She has taught a wide range of interdisciplinary and community-engaged courses at public, private, tribal, and carceral institutions. Tria is the founder of Race and Yoga Working Group and a co-founder of Race and Yoga journal and Race and Yoga Conference. She performs and publishes her poetry in a variety of venues. According to the scholarship or lack thereof, one might assume that neither Native Americans nor imprisoned people are very funny. One might also reason that at the center of this convergence, Indigenous people who are incarcerated comprise the least humorous group of all. In general, there is a dearth of literature about Native peoples who are imprisoned, but that which does exist tends to take a quantitative, social sciences approach and emphasizes how settler colonialism leads to the criminalization of Indigenous peoples and the detrimental treatment that they endure. Yet, because the criminalization and dehumanization of Native peoples is inextricably intertwined, highlighting Indigenous humorÃ¢â‚¬”a component of Native humanityÃ¢â‚¬”is important. 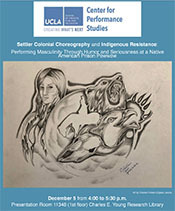 At the intersection of Indigenous, gender, prison, and dance studies, this paper dispels stereotypes of Native and imprisoned men as stoic and subordinate by juxtaposing a close analysis of the switch dance with readings of five “forty-nine songs” that Indigenous men who were incarcerated performed at a prison powwow. Although I find the switch dance and forty-nine songs contrast in tone, they similarly challenge settler narratives by asserting the endurance and strength of Indigenous agency, humanity, and positive masculinity. I bring in “fixing” and “eclipsing,” two interlocking, theoretical concepts that I previously created to locate the switch dance and forty-nine songs within the context of ongoing colonization and the settler structures, which contribute to Native peoples’ disproportionate incarceration, punishment, and other methods of physical and cultural genocide. I conceive of U.S. aims to manage Indigenous movement as “settler colonial choreography,” which underscores the racial and gendered sovereignty of the U.S. The term “settler colonial choreography” dually operates to illuminate Native bodies and their mobility as targets and locate the corporeal and movement (or lack thereof) sites of possibility. Hosted by the UCLA Center for Performance Studies. UCLA is a tobacco-free campus. All-day parking ($12) and short-term parking (payable at pay stations) are available in Lots 2, 3 and 4 (enter the campus at Hilgard and Westholme avenues).